Teenagers need increasing freedom with increasing age. At the same time, parents have the job of keeping them safe. And managing these two important demands is not easy for many us. Were we able to control them fully, teenagers might be a lot safer than they are. However, we are not, nor is it wise for us to try. And most parents know both these things. Teenagers do need to venture out into the world where we can no longer control what they do enough to ensure their safety. They need increasingly to spread their wings, because doing so is necessary, if they are to learn how to cope with the adult world. Two guide lines can help us with this. 1. Expand their freedoms gradually and only when they are managing how much they already have. Doing this effectively relies on our having an accurate understanding of each young person’s actual capacities. To know these, we need to know them well. So obviously, we need to keep in contact with them enough for this. It also helps for us to have a general idea of what we can expect from teenagers of the ages our teenagers are. •	generally, what are they going to do? •	what specific activities are planned? •	how safe/dangerous is what they plan? •	where are they going ? •	who else will be there? •	what supervision if any is involved? •	who is meeting them? •	who is bringing them home? •	what time are they expected back?. We are wise not to assume that everything is safe just because, for example, the school or some parent we know is involved. Not everyone takes safety issues seriously enough for us to count on them. So direct contact with any adults involved is always a good idea. We need to keep doing safety-risk assessments, even if our teenagers think that we are interfering. Far better that they come home safely to challenge us for our ‘over concern’, than that we have to attend them at the hospital, police station or morgue. Besides, the more often we go through the process with them, the more they will learn to think in the same way about safety issues for themselves. Of course, in all safety matters, it is crucial to have effective ways of making safety-risk assessments. 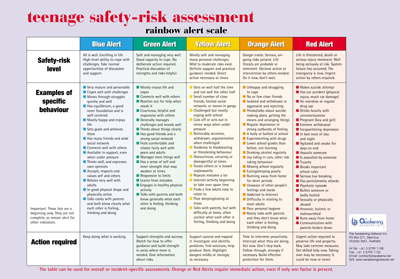 The Rainbow Alert Scale is designed to help parents and other adults to do so as reliably as possible. It helps us to make the assessments, to decide how urgent action is, and to figure out what to do. The Scale passes from a Blue Alert, through Green and Alert, to Red Alert. Blue Alert shows everything is fine, while Red Alert indicates extreme and present danger. Teenagers themselves also like using it to check on their friends and themselves. Looking at it often stimulates discussion in classrooms as school, youth clubs and other places teenagers hang out, at home with parents, and brothers and sisters. The main thing to remember is: When problems are identified, something effective needs to be done. Also, remember to get expert help if you need it. PLEASE NOTE THAT YOU ARE COMPLETELY FREE TO COPY AND USE THIS TABLE. WE WANT PEOPLE TO BENEFIT FROM ITS AVAILABILITY. MAKE AS MANY COPIES AND DISTRIBUTE IT AS WIDELY AS YOU LIKE. ALL WE ASK IS THAT YOU RECOGNISE ITS ORIGINS IN THE AWAKENING NETWORK INC. AND TEEN STAGES, KEN AND ELIZABETH MELLOR'S BOOK. Purchase A3 or A2 sized copies of this poster in the Network's shop. You can see from the chart that some teenagers live with most areas of their lives in Blue or Green Alert, but with one or two aspects in the problem or danger alerts (Yellow, Orange or Red). Also, as teenagers pass through normal crises, it may be appropriate to ‘call’ a Yellow, Orange or Red Alert for the duration of the crises and drop the level back again when it has passed. By contrast, when all is well and moderate to serious crises have not arisen, an overall Blue or Green Alert is appropriate. Above all, whether an assessment is general or specific, we must act in some way for safety’s sake when Yellow, Orange and Red Alerts apply, and can relax in the others. All is well. They are excelling in life and making the most of their opportunities. They have high-level abilities to cope with challenges. We only need to take normal opportunities of discussion and support. They are safe and managing very well. They have good capacities to cope. No deliberate action is required. We only need affirm their skills and have practical discussion of risks as necessary. They are generally safe. They face many personal challenges, which they mostly manage. Nevertheless, mild to moderate risks exists, so they need definite support and practical guidance from us. Direct action is necessary at times. Overall demands may over-load them. Danger exists. Serious, on-going risks are present. Life threats are probable or imminent. Decisive intervention by others is necessary. Do it now, don’t wait. They are on the brink, although not yet over it. Single things may cause significant problems because they are so seriously at risk. Life is threatened, death or serious injury is imminent. Wellbeing is seriously compromised. System failure has occurred. The emergency is current. Urgent, direct action by others is required. This is usually a now or never situation. Single things are a definite problem that demand action. The best thing to do is to think ahead. Hope for the best, think of the worst and plan practically and realistically.